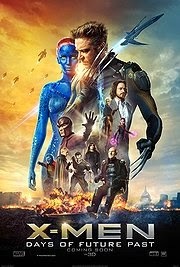 I love the X-Men movies. They’re probably my favorite superhero franchise. I love how it’s less villain-based and more of an “us against them” theme, which in turn creates and drives the inner conflicts within the mutant world. And this new installment is far from the exception. It was awesome–the special fx, the set pieces, the consistent pace, and the unique formula and storytelling. You can’t really go wrong with time travel films because it’s in their nature to not be formulaic. However, unlike every other time travel movie where the character who travels back in time is the one who is developing throughout the course of events, that character in this film (Wolverine) is the only one NOT developing. I know that in the nature of the film it’s “not important” that he develops, but I’d like to think that on a macro scale it is important. And as for the characters that DO develop, it doesn’t even really matter (with maybe the exception of Mystique) because we’ve seen it all before. In fact, they spend several films arcing these characters into who they are before this movie. The actions in this film are just serving the plot–not the characters within it–since they all would have turned out fine anyway. I sure know that the audience didn’t need to see Professor X and Magneto become who we’ve already seen them become. The filmmakers just relied on the character depth that they had already developed in the previous films. I’m not saying that Wolverine going back in time wasn’t important, because it was necessary for the future of the mutant world. All I’m trying to say is that this plot didn’t serve well for the progression of any of the characters within the movie because we’ve already seen where they end up and it’s not too bad. Don’t get me wrong, the characters definitely give you the ability to feel for them, it’s just that in the long run, what about their character is at stake? But I guess we will see what happens with the future of this franchise and where they decide to go with it. You can’t just help feeling that the conclusions of all the past X-Men films now become void and obsolete. Now, although the plot is self-serving, it’s still very entertaining and fairly original. I’m just saying that pretty much 100% of the issues in this film lie directly in it’s inability to further its character’s depths past where we’ve already seen them. We are simply just getting an origin to a story that we are unsure of now.